New in 2012 are these wonderful "cold cast bronze" figurine urns designed to look and feel like real bronze. 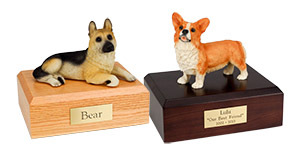 Each figurine is hand painted in Italy and designed to appeal to pet owners whose pet didn't have the exact coat or color patterns shown in our standard line of "color" figurines. Some people of course simply prefer the appearance of these faux bronze figurines. Each urn base is made from North American hardwood and is available in the light maple, medium oak or dark walnut finishes. 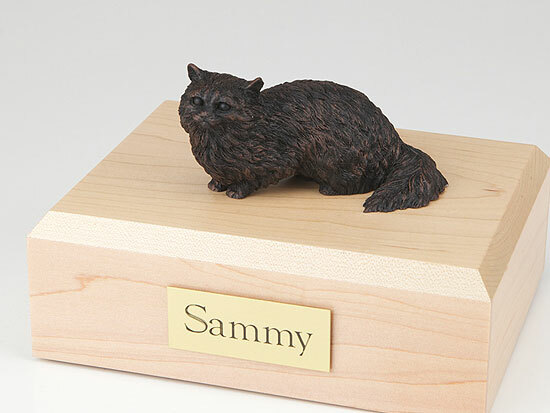 This urn offers you a choice of 80 different purebred dog, cat, horse and rabbit figurines attached to our beautiful wood urn bases. We also include a personalized (4 line 100 character) inscription on a premium leaded brass nameplate. Your pet's bagged ashes are installed through a removable bottom which is secured with screws, providing tamper resistant protection. Rapid 1-Day and 2-Day air shipping is available! We attempt to ship all orders placed by 11 a.m. the same business day from St. Paul, Minnesota. 7.75" x 6" x 2.75"
7.75" x 6" x 3.75"
7.75" x 6" x 4.75"
7.75" x 6" x 5.75"